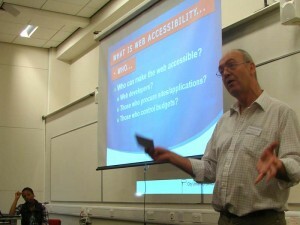 On September 21st 2010 I attended and presented at the first Accessibility London Unconference (a11yLDN). The one day event was organised by Makayla Lewis – a PhD student from City University in London. Her area of special interest is motor impairment and so some of the day focussed on that area of disability, but other general accessibility aspects were covered too. The format of the event was a series of seminars and workshops and Makayla had enough speakers to be able run two and sometimes three seminars at a time throughout the day. This had its downside though as everyone missed some superb seminars and workshops during the day. See the Accessibility Unconference schedule here. Tickets for the event were in great demand and all were snapped up within 3 days of the event being announced. I opened the unconference with a session entitled ‘What is Accessibility?’ I wanted to try to address some fundamental questions concerning what people mean by accessibility, and analyse why it’s important and who can bring it about. After that Makayla spoke in more detail about motor impairments – an area she feels has been overlooked. Our slides for this presentation can be seen at Slideshare here, and other presenters’ slides are also being uploaded to Slideshare too – follow the links on the Schedule page. Looking back it occurs to me that the slides on their own do not convey the full message so I will be posting a series on the aspects that Makayla and I covered on this blog. Feedback on the event was very positive and there are already stirrings about doing it again next year. There’s a Flickr photostream from the Accessibility Unconference too. James at the Pretty Simple Blog has provided his summary of the day. 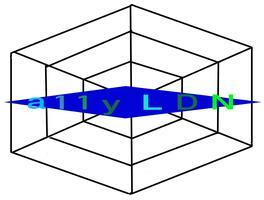 There was extensive tweeting on the day itself – reporting on key aspects of the content of the various presentations – you can see this by viewing the Twitter hashtag #a11yLDN.